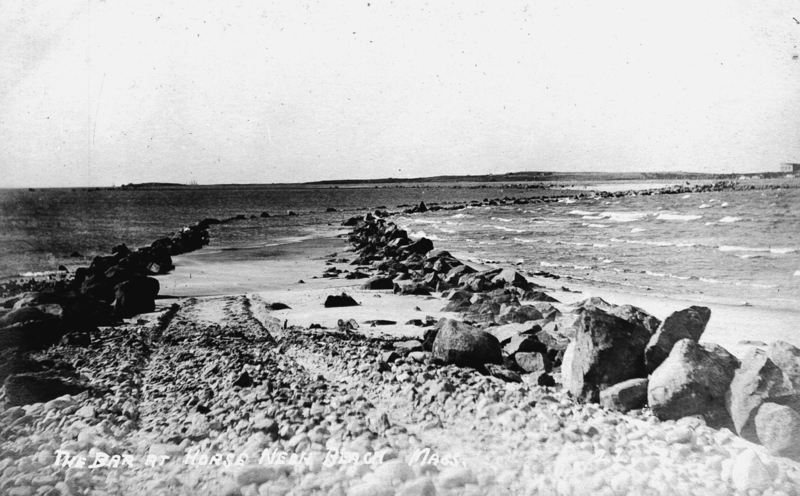 Gooseberry Island remained relatively undeveloped throughout the historic period and could have been occupied by Native American residents over the Contact Period. Summer visitors and residents could walk to the spit of land at low tide but were often trapped when the tide came back in. 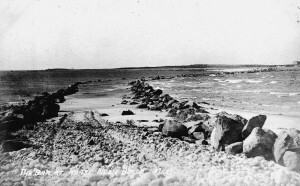 The construction of a stone causeway in 1924 connected Gooseberry Island to Horseneck Beach and in the 1930s the Army constructed an Artillery Fire Control base on the peninsula as part of a coastal defense system. Remnants of the military occupation remain today in this conservation area, including portions of the observation towers, barracks, and supply sheds. 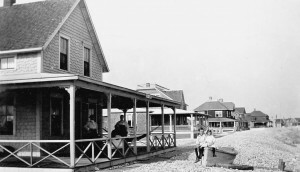 Following the war, Gooseberry Neck was briefly run as a campground and casino. Today it is included as part of the Horseneck Beach State Reservation (Begley 1998). This area along Westport’s shoreline had been heavily developed through the 1930s, lined with summer homes, hotels, groceries, and even a bowling alley. The 1938 Hurricane destroyed the entire beachfront community, wiping out virtually every structure that stood along the coast. One structure that is still standing is a lifeboat station at Horseneck Beach that was used in the nineteenth century. Subsequent development was limited and while remnants of this summer community may remain, it is likely that the combination of waves and wind destroyed most of the historic period deposits associated with the pre-1938 use of the land. The creation of the Horseneck Beach area as a state reservation occurred in the 1950s and led to the construction of Route 88 as an access road for summer visitors.